Welcome to the website of the Sea, Beach and Juttersmu-Sea-um in Zandvoort by the sea. 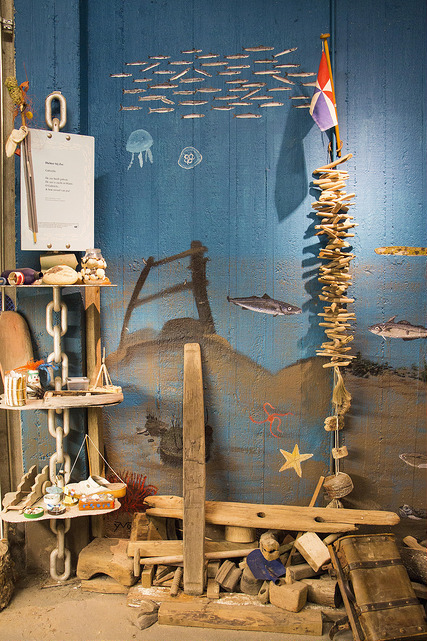 The Juttersmu-ZEE-um is a FREE ACCESS museum where we show what the beachcombers find on their way along the beach. The beachcombers rise early in the morning, and rush to the beach. They defy wind and weather all day to see what washed up from the sea. Especially after strong storms this can be quite a lot! Perfume, lighters, a mammoth tooth, whole and half dolls, old ordnance, shoes, toys, glasses, bottles station, remains of ships or aircraft, a piece of metal from a NASA rocket; You name it they 'll find it! Everything has its own story and show us some history. That history we are trying to discover. Much of what the sea has ever taken away finds it's way back to shore here in Zandvoort. A lot of the stuff that is found, is to be seen in the Juttersmu-SEA-um. Come see and explore! Learn about the sea and the beach! Listen to the (Beachcombers) stories behind the found objects. Immerse yourself in the history that's being written by the sea every day. Would you like to stay up to date of all the news about the Juttersmu-ZEE-um? Take a look at the beachcombers news. Here we place info about our opening hours during summer holidays, if we found anything special, and info about events.